With nearly 7 million visitors exploring its galleries each year, the Smithsonian National Air and Space Museum (NASM) is the most popular museum in North America. 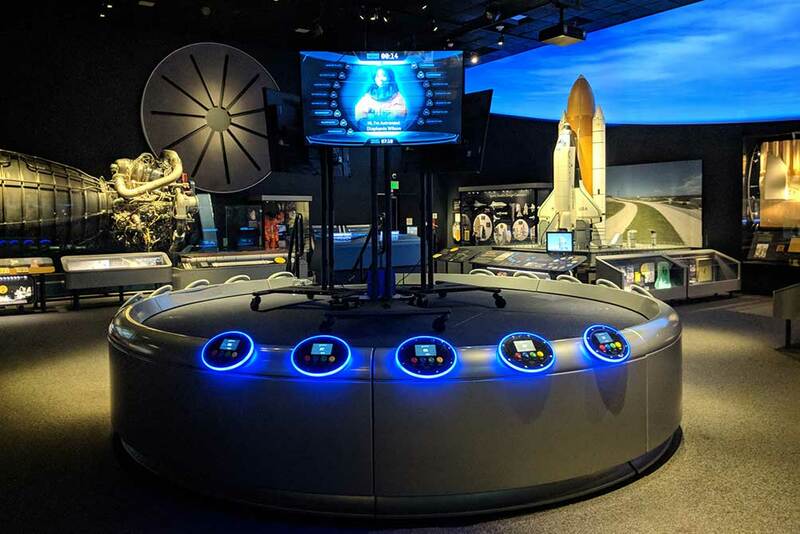 Ideum was thrilled to have an opportunity to collaborate with NASM to reimagine a series of earlier digital exhibits in the Moving Beyond Earth gallery. 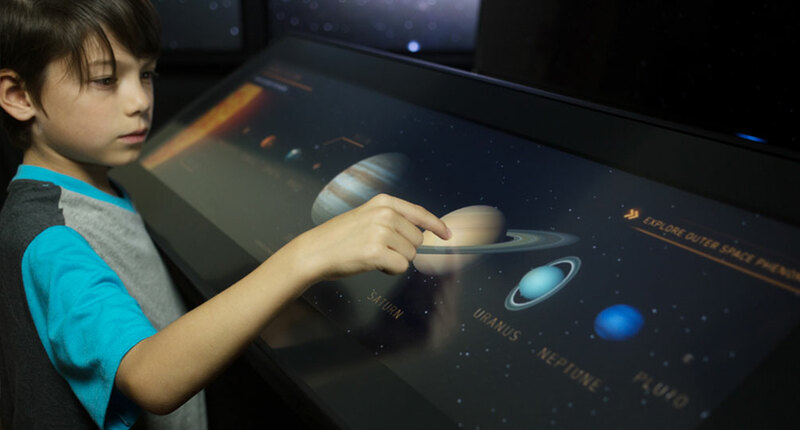 Back in 2015, Ideum worked with NASM to recreate a large multiuser multitouch table exhibit. Design It! allows visitors to create their own modules for the International Space Station (ISS). This time around, Ideum developed four interactive experiences, including the centerpiece multi-user game Space Flight Academy. 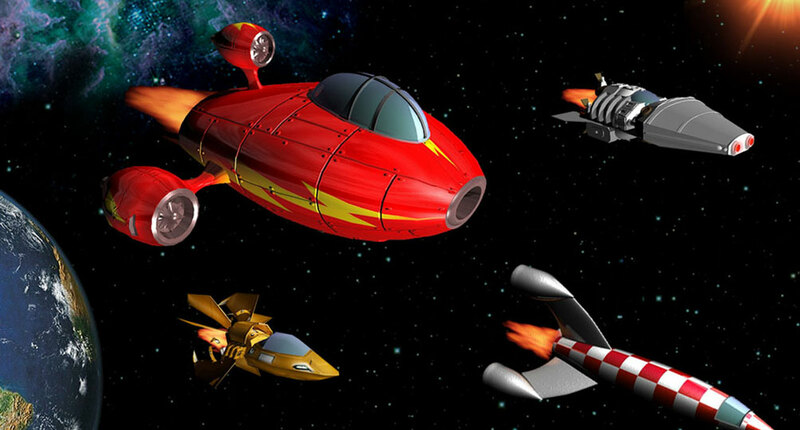 Space Flight Academy is a group trivia game that allows up to 15 visitors to play together. Ideum redesigned the game, developing the software and designing and building the custom faceplates and cases for the exhibit’s 15 user stations. Each station has arcade buttons, a Raspberry Pi microcontroller with 5” color LCD screens, reactive LED lights, and a small speaker. The stations are networked to a server that runs the games and keeps track of each visitor’s score. At the end of each game, players are ranked on a scale from “In Training” to “Flight Ready,” providing all users with encouraging feedback about their space flight knowledge. The game’s questions and accompanying high-resolution photographs and video are presented on large LG Ultra HD 4K monitors. The experience is open-ended, allowing visitors to join in at any time. NASM staff can easily update the application through a custom CMS. We also built several other exhibits during this phase of work. Flight Director takes visitors through a spacewalk scenario where they play the role of decision-maker. As the Flight Director, visitors consult with their teams, getting advice and information before deciding how to proceed. There are two stations visitors can use to go through the experience. 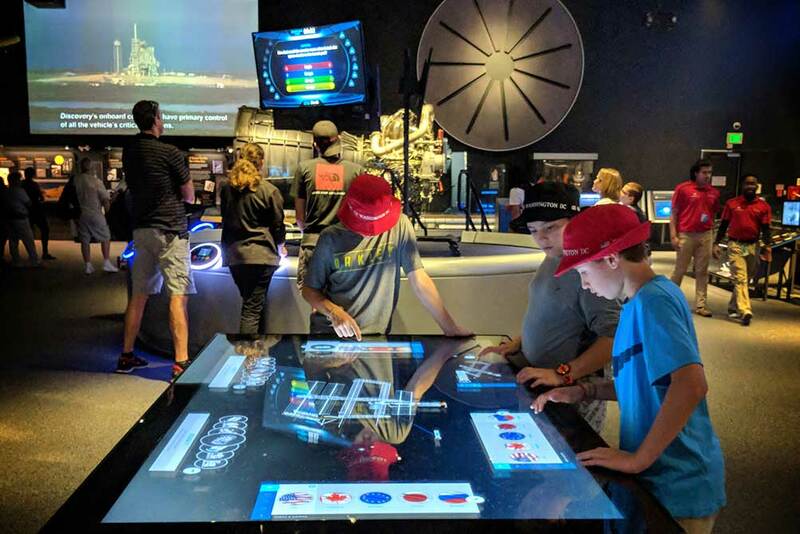 Ideum worked closely with NASM to update the exhibit’s technology, look and feel, and the flow of the gameplay to make the exhibit more engaging and compelling than its predecessor. 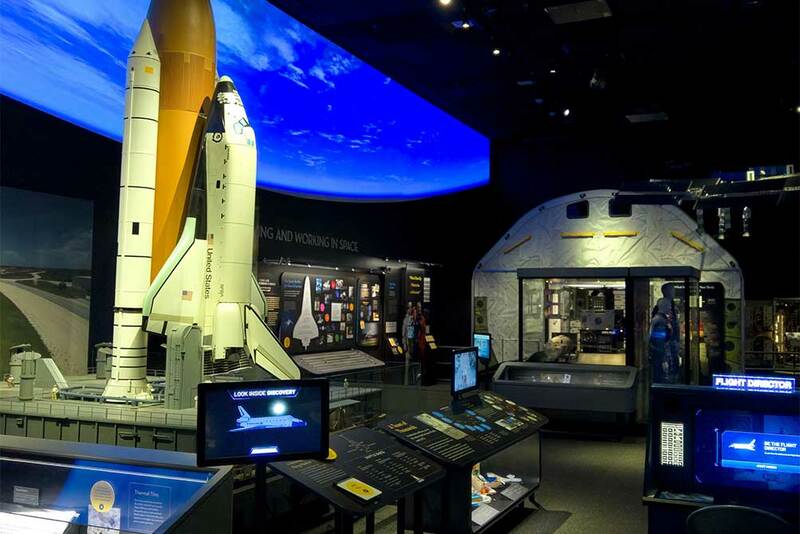 Look Inside Discovery allows visitors to view interactive panoramic images of the Space Shuttle Discovery. A digital 3D model provides orientation and context, letting visitors know where they are in the shuttle, with a nearby physical model of the shuttle just beyond the screen. Finally, Space for You asks visitors questions about their interests and matches space-related jobs with their answers. Here, visitors can take pictures of themselves, create an ID badge, and send it via email at the end of their experience. All of these exhibits are operated remotely, and Ideum collaborated with NASM to design the systems that allow for networked operation. Ideum also developed the server that processes emails sent from Space for You and Design It! 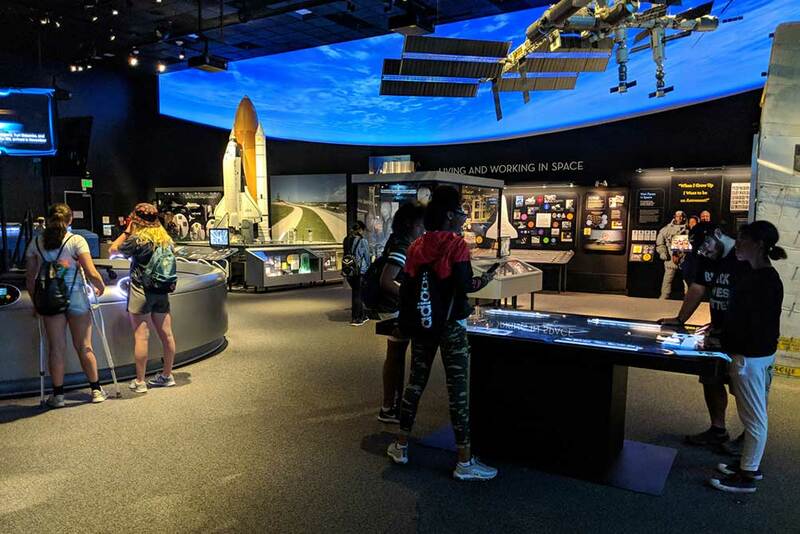 Our ongoing collaboration with NASM has resulted in a whole series of exciting and innovative experiences that let visitors explore the ideas and processes of space flight like never before. We look forward to the next mission! 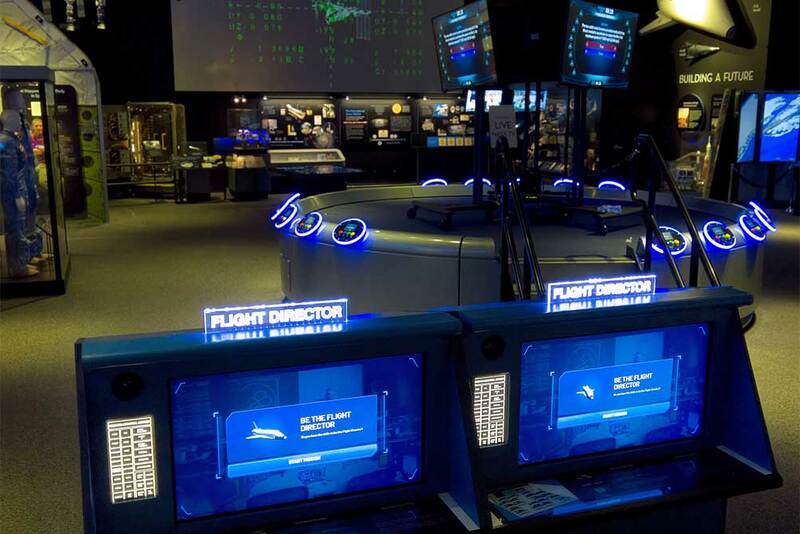 The Flight Director exhibit lets visitors guide a space mission. Look Inside Discovery gives visitors an astronaut’s view of the space shuttle. At Design It!, visitors create their own space station modules. Ideum and NASM have developed a suite of compelling interactives about space flight. Space Flight Academy allows groups to test their spacefaring knowledge.